Thanks for sharing your heart on this. As a father, grandfather, and great-grandfather, I, too, was (and still am) overwhelmed by last Friday. I preached three times on Sunday, the Sunday of Joy in the liturgical calendar. The joy wasn’t the bubbling sort of joy that many expect, but it was a joy wrought out of coming to grips with the fact that Jesus came for that very reason, last Friday. Explanations, rationalizations, scapegoats, all pale in comparison to the God of all love and compassion, who understands what it is to lose a loved one—for us. Thank you so much, Rich, for reading. I am so glad you found it. And thank you for preaching faithfully and being their to minister to your people! Blessings (and joy!) this Christmas! 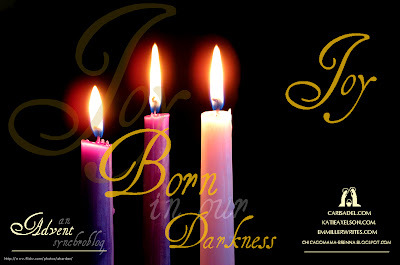 "Born in our darkness" seems like a prophetic choice in titles this week. It is dark. It was dark 2,000 years ago. But joy is like the Advent candles flickering in that darkness -- they remind us it's there. It has come and is come and will come again, if we just remember to light the candles. That must have been a rough day, holding the reality of what happened halfway across the country and the reality of what you needed to do here together, all on the same day. I'm praying with and for you, friend. Thank you for your prayers. I have to trust God to keep my babies safe, even when atrocities like this can happen unexpectedly. I love your finish here, "The God who sets all things right." Yes. Redemption is the basis of our hope and the certainty of our joy. A heart-felt, yearning post. Loved it, Brenna. Thank you, Kelli. He will set it all right. I know.